Market abuse refers to processes in which individuals and/or firms aim to decrease market integrity and reduce investor protections. An offence related to Market Abuse is Market Manipulation. In 2016, the Market Abuse Regulation (MAR), which contains prohibitions on market manipulation and other market abuse offences, came into effect. You can find out about this in the introduction to VinciWorks’ Market Abuse Course. 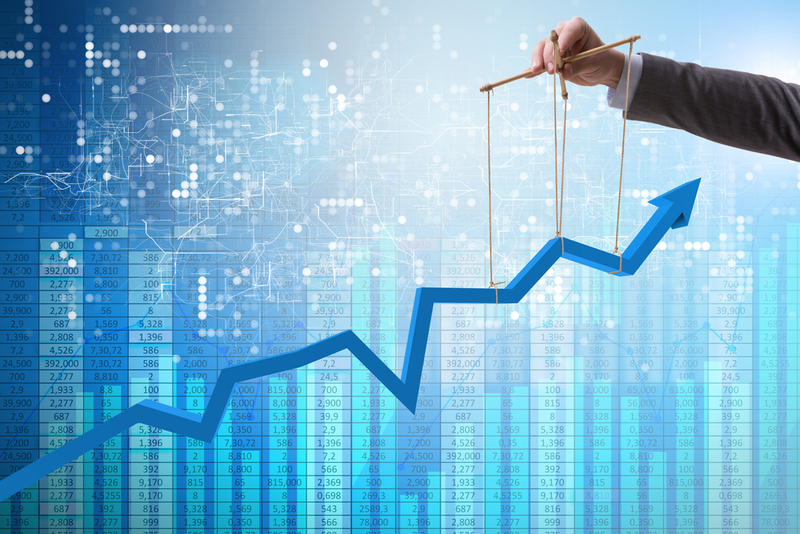 Market manipulation occurs when individuals act in ways that prevent the market from operating in a free and open manner. This can involve providing false information about the supply, demand and price of financial instruments that inhibit or detract individuals from engaging in market transactions. So too, market manipulation involves entering into transactions that can affect the price of a financial instrument. Why would someone engage in market manipulation? People usually engage in market manipulation to generate an increase of securities or to potentially undermine a competitor. Media channels: Market abusers use the media to advertise an investment without revealing a conflict of interest. Ownership: Market abusers use a series of transactions to conceal the ownership of investments. Pump and dump: Market abusers disseminate positive, false information to drive up share prices. They then sell the shares once the price has peaked. Trash and can: Market abusers disseminate negative information to drive down share prices. Wash trade: The same investment is bought and sold repeatedly to give the impression of increased demand. While it appears like there are so many opportunities for such unlawful behaviour, there are mechanisms which minimize market manipulation. How to deal with Market Manipulation? In order to prevent these instances from occurring, safe harbours are used. Safe harbours include market sounding, stabilisation and legitimate behaviours. Market sounding is a legitimate communication of information, prior to the announcement of a transaction, in order to gauge the interest of potential investors in a possible transaction and the conditions relating to it. This is the purchase or offer of securities undertaken by an investment firm in the context of a significant distribution of securities exclusively for supporting the market price of those securities for a predetermined period of time, due to selling pressures in such securities. These are recognised legitimate behaviours which do not result in a presumption of market abuse. This includes market makers, takeover bids and unsolicited orders. Along with these safe harbours, regulatory bodies exist to prevent the onset of market manipulation. In July 2016, the Market Abuse Regulation (MAR), which contains prohibitions on market manipulation, took effect across Europe. In the UK the Financial Conduct Authority (FCA) exists as a regulator for financial firms and financial markets. The FCA detects whether firms violate the MAR and punishes them accordingly. They also deal with suspicious transactions and order reporting regime. An investment recommendation refers to information that suggests an investment strategy concerning one or several financial instruments or the issuers, including any opinion as to the present or future value of the price of these instruments, intended for distribution channels or for the public. In order for investment recommendations to be credible, they must meet transparency requirements. This prevents the dissemination of false or misleading information and enables investors to trust the validity of the recommendations given. Further, it is imperative for investment recommendations to be as objective as possible to ensure that any potential biases are minimised. In an attempt to raise the firm’s funds, in 2014 Montgomery Street Research engaged in wash trading, which involves the simultaneous purchase and selling of securities to give off the impression that there is high traded activity with no actual change in the value of securities. This tactic proved fruitful as they were able to raise $2.5 million from investors. Thankfully, the Securities & Exchange Commission (SEC) brought an enforcement action against the company which ensured that their actions did not go unnoticed. Morgan Chase and HSBC manipulated the prices of silver futures and option contracts. The two banks spread rumours that the value of silver would reduce significantly, knowing this information was false as they controlled a significant amount of the commercial net silver futures. This enabled the banks to make illegal profits at investors’ expense while simultaneously restraining competition. VinciWorks course, Market Abuse: Know Your Trade, contains a module on Market Manipulation. 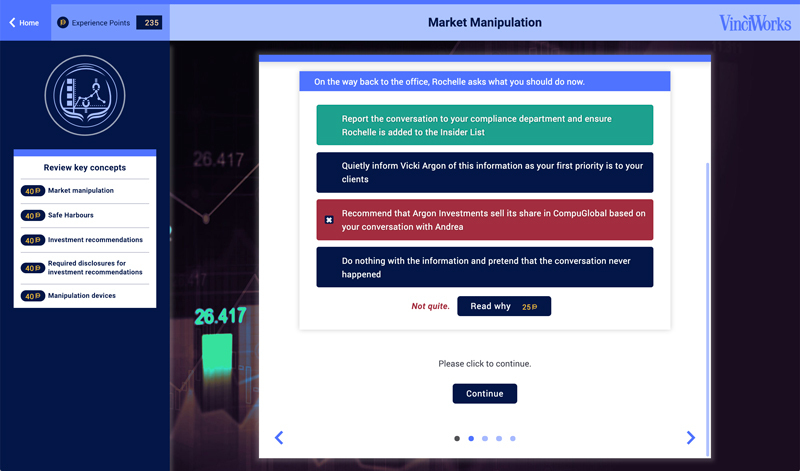 The interactive course presents scenarios that requires users to determine whether or not market manipulation is occuring. You can demo the course for free here. This entry was posted in Thought leadership on 31st January 2019 by VinciWorks.